The Universal Declaration of Human Rights (UDHR) was adopted by the United Nations General Assembly on 10 December 1948. It was born of the international community’s determination to never again witness the atrocities that were perpetrated against human beings during the Second World War. Therefore, alongside the UN Charter document, world leaders drew up a road map to guarantee the rights of individuals across the globe. Our 2017 report highlights the growing abuse of Article 18 rights worldwide, and urges the UK Government to respond. 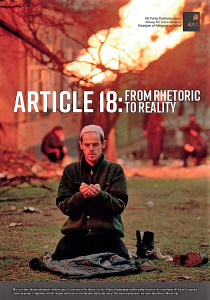 ARTICLE 18: FROM RHETORIC TO REALITY, highlights the current rhetoric of the observance of Article 18 of the Universal Declaration of Human Rights and underlines practical measures that can and should be taken by the UK Government to turn this rhetoric to reality to protect the millions who are vulnerable to violence, discrimination and disadvantage as a result of its abuse. Our first report, ARTICLE 18: AN ORPHANED RIGHT (2013) also examined the abuse of Article 18 rights worldwide, and what the British Government could do. The UDHR, with its total of 30 articles, was presented not as a legally binding instrument but as an aspirational document outlining essential guidelines on fundamental human rights, and with the stated objective of realising “a common standard of achievement for all peoples of all nations”. Eight nations from the assembly abstained from the vote to adopt the document, but none dissented. Although initially not envisaged as creating binding legal obligations, Article 18 has over time acquired a normative character within general international law, arguably binding all states. It established a platform for articulating and elaborating the provisions on freedom of religion and religious non-discrimination in the (1966) International Covenant on Civil and Political Rights (ICCPR) and the (1966) International Covenant on Economic, Social and Cultural Rights (ICESCR), which together are known as the “International Bill of Rights”. Everyone has the freedom to manifest their religion or belief, either alone or together with others, publicly or privately. Nobody is to be subject to coercion that would impair the individual’s freedom to have or adopt a religion or belief of their choice, nor is discrimination on the grounds of religion or belief permissible. Article 18 remains the benchmark against which the enjoyment of the freedom of religion or belief should be measured. But despite the best efforts of many, freedom of religion or belief is not currently being protected internationally as it ought. Unlike many other human rights, there is as yet no focussed United Nations (UN) Convention directly addressing the subject of freedom of religion or belief. In consequence, freedom of religion or belief has for many years been something of a ‘residual’ right, only protected to the extent that it does not stand in the way of achieving some other goal or ambition. While the UN Vienna Declaration of 1993 asserts that all human rights are universal, indivisible, interdependent and inter-related, in practice within the family of human rights this freedom remains on the margins. It is in this respect ‘an orphaned right’. Across the globe there are all too many examples of state intimidation, discrimination and violence towards people on account of their religion or belief, as well as situations where states do not offer adequate protection from persecution by non-state actors. This is not limited to any one region, or any one form of religion. This catalogue of abuse covers Shia Muslims in Bahrain, Baha’is and Zoroastrians in Iran, Christians across large swathes of the Middle East, Sufi muslims from the Sunni tradition in Somalia, atheists in Indonesia, Falun Gong practitioners in China, Buddhists in Tibet, Jewish people in Europe and Hindus in Pakistan — truly a global concern that affects the full range of religious and non-religious belief. While we note that a particularly heavy price is being paid by Christians, we also recognise that persecution is not confined to any particular tradition, but is common to all the major faiths, as well as many newer and less well-known beliefs, and those people who reject religion entirely. We are convinced that the focus of the UN ought to be less on when it might be appropriate to restrain rights in the name of religion, and more on encouraging and supporting international action to champion freedom of religion or belief for all. Alongside this it is necessary to identify effective UK policy and action aimed at achieving the same goals. “We must stand together in defence of religious liberty and the scandalously neglected Article 18 of the UN universal declaration of human rights. People have the right to practise their faith, or lack of it, without fear. But without determined action on the part of the West it will not happen.